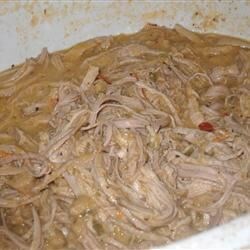 "This delicious tomatillo-based sauce can be made with beef, pork or chicken though it is traditionally served with pork. Unfortunately, I don't have precise measurements of the seasonings, but do some tasting along the way! Serve it over rice for a delicious Mexican dish!" Slice pork chops into strips, and season with pepper, garlic powder and seasoning salt. Squeeze lime juice over pieces. Heat a skillet over medium heat. Add fat, and cook, stirring until pan is coated. Remove fat, and put the seasoned meat in the pan. Fry until browned, about 5 minutes. At the same time, make the green sauce. Combine the tomatillos, tomato, jalapenos, and dried chilies in a saucepan. Bring to a boil, and cook until soft. Drain excess liquid, and transfer to a blender or food processor along with the garlic and salt. Blend until smooth. Pour sauce over the meat in the pan, and simmer for 15 minutes to blend all of the flavors. Taste, and adjust salt and pepper if necessary. Really fast and easy to make. It was too sour for me so I will not make again. Fast and easy, a delicious meal. I added one large green bell pepper, in slices, to the pan to simmer with the meat and sauce and it came out great!